Members of Gananoque, Elgin, Seeley’s Bay and Westport Lion Clubs stand and sing O’ Canada at a joint meeting held in Seeley’s Bay. 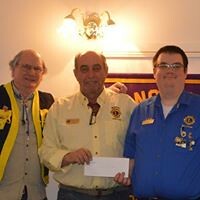 Westport Lion Club president, Wayne Bent, secures our gavel after it went missing after Seeley’s Bay president, Al Stewart, paid a visit to Westport. 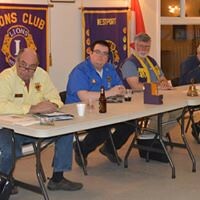 Last Tuesday night, Lions Jim Scala, Wayne Bent and Bob Reddick attended the Zone 30 South meeting in Elgin. 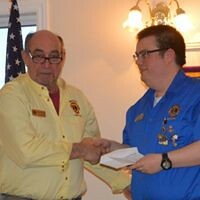 President Wayne Bent gave his annual report to the representatives of local clubs as far away as Prescott. In April, five members, plus Lisa and Mike Walsh travelled to Cornwall to participate in the annual district convention. At this conference, our Club was recognized for our outstanding efforts in raising $20,000 to cover the cost of Lisa’s e-sight glasses. Lisa spoke to 380 delegates how the e-sight glasses had changed her life. Since our club won the Governors Golf Tournament in 2016 we won the right to organize this year’s tournament. Lion Gary Warriner worked hard organizing this year’s tournament but the number of participates did not warrant running the 2017 tournament. Lion Mike Robinson started the recycling program season in May and it continued until the fall. This program continues to be a money maker for the Club and provides a service to the community. In June, the Club enjoyed an evening at the 1000 Island Playhouse attending the show, The Million Dollar Quartet. During the same month, 204 Lions attended our annual steak BBQ fundraiser. Clubs as far away as Glengarry attended this well known and popular event. One of our more unique fundraisers is the Rock the Beach volleyball tournament held in June. The tournament has grown over the years, requiring the Club to build a second court. All the money raised in this event goes directly to maintaining the beach. Agruably, one of our most cherished services to the community is the Lions Beach. Lion Don Baker and his team kept the grass cut, the beach weed free, and the washrooms/change rooms clean. This a big time commitment because some jobs must be done daily. During the summer months the Club was happy to host three CPHC senior lunches in which an average turnout of 55, very appreciative local seniors attended. On July 12th, the Club held its annual Awards Night where the highlight of the evening was Lion Michael Harris being awarded Lion of the Year. On September 27th we had a visitation by Perth and Seeley’s Lion Clubs to help us induct four new members, Chris Norman, Robert Merkley, George Jones and Rene´ Reynen. Our current membership is now 32 men and two women. Also, during that meeting, Lion Jim McGlade was presented with a well deserved Life Membership. Again this year, club members handed out treats to the young people on Halloween and Lion Jim McGlade and his team once again conducted vision screening for the students of Rideau Vista and St. Edwards’ schools. The Club was honoured to be able to lay wreaths at Westport and Newboro’s centotaphs during Rememberance Day. At the end of November, our club hosted the annual Santa Claus Parade. Organizer Craig Jackson made some changes to this year’s route that proved to be very popular. The mobility program saw our two vans travel over 24,000 km., in 276 trips, for a total of 1,000 volunteer hours by members and non members. Fortunately this program is currently able to sustain itself by a trust fund, donations from the community and users, and the $6,027 raised at the annual breakfast held at The Cove. If the current trend in useage continues, more of our fund raising efforts will need to be directed towards the mobility program. The Club also organized first aid training for members and van drivers. We greatly appreciate the tremendous support from the community for our annual fundraisers. The spring draw for the beach, our $10,000 draw and our $10,000 cash calendars. 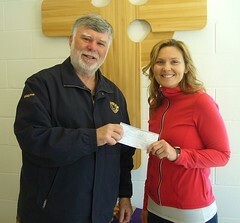 In addition, the members had a fish fry in June, a roast beef dinner in July and a chicken BBQ in August to raise funds. Also, we ran three canteens at various functions to raise money. The Christmas cakes for seniors continues to expand and is appreciated by the seniors. The seniors have the option of picking up their cake at the clubhouse where they can enjoy friendship, coffee and snacks; or they can have their cake delivered by club members. A total of 270 cakes were given out this year. With the help of an anonymous donor buying the food, the Westport Lions Club hosted the annual Christmas dinner for 55 individuals. Santa took time from his busy schedule to make an appearance and gave out gifts to all the children present.